Planning is one of the most time consuming parts of teaching. On teaching practice, many people stay up until all hours putting final touches to lesson plans and making resources. In resource, I manage to do my weekly planning in approximately 25 minutes a week. This is because I am very strict with myself and use last weeks plans as a guide. In September/October I spent a long time getting my IEP’s and Termlies finalised and now the rest of the planning is easier. For my weekly notes I decide what exactly I want the child to learn/ be able to do. I use learning objectives or WALT (We are learning to…) to focus myself. 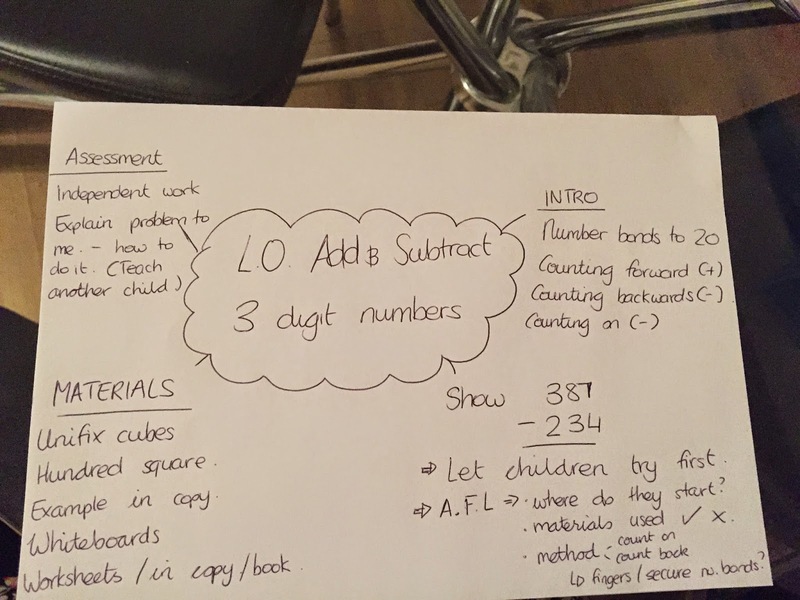 For example – this week I wanted one child to add and subtract two digit numbers without renaming. This became my learning objective and I brainstormed how I would do it and what materials would be needed. (see above). Skip two boxes, start the next question.